This little piggy went to the market. And this little piggy got antibiotics. 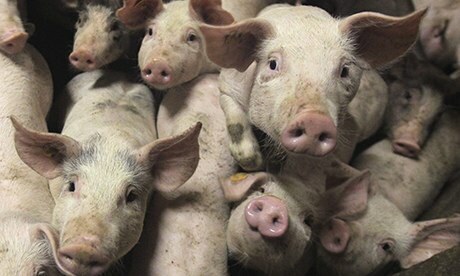 That’s bad news because feeding animals like pigs antibiotics – often done to boost growth and prevent disease – leads to antibiotic-resistant bacteria, giving rise to dangerous superbugs that can’t be treated by regular medicine, according to a study published Tuesday in mBio. It’s an example of what the World Health Organization describes as a global health crisis. Researchers at Michigan State University studied pig farms in China and another population of pigs in the U.S., and found the use of antibiotics added to drug resistance. The researchers believe that the bacteria learned to adapt to the drugs designed to kill it, thereby making the treatment less potent. Since the resistance can be transmitted between bacteria, experts are calling for a plan of action to minimize a risk to humans, according to the release. Nearly 50 percent of antibiotics used in hospitals are unnecessary, according to the Centers for Disease Control and Prevention. Some antibiotic-resistant infections, such as MRSA or C. diff, can lead to serious illness in humans, requiring longer recovery time and increased medical expenses. The CDC reports that at least 2 million Americans are infected with antibiotic-resistant bacteria annually, and at least 23,000 people die each year because of these infections.